“The original edition was more or less a transcript of the original conversation. It was edited, of course, to make the English clear and correct and to make it readable. But basically it remained a transcript of the original conversation. The 1993 version changes all of this. The book is slashed from 99 pages to 77 pages! And the type is not even smaller! So much has been cut out. In one place four complete pages have been deleted! The BBT International has tried to justify the changes to Perfect Questions, Perfect Answers. But their attempted justifications are mutually exclusive. 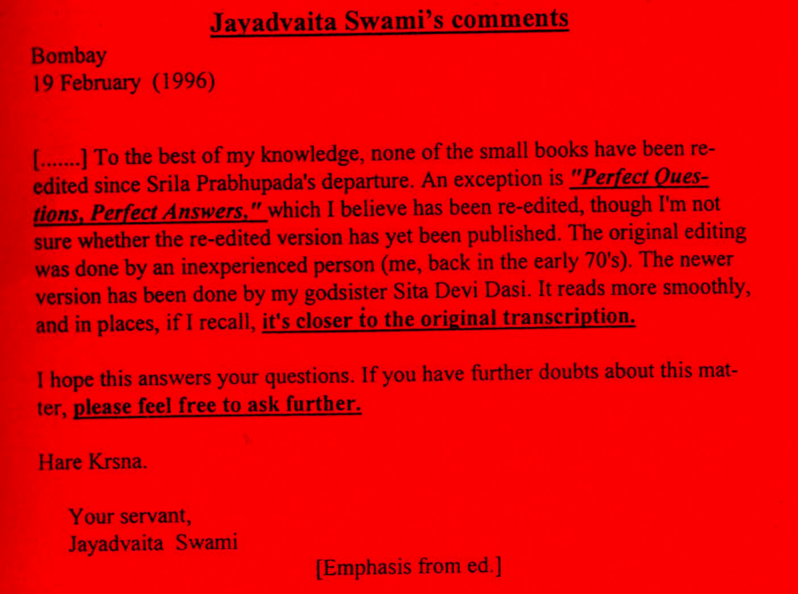 In this letter Jayadvaita Swami mentions the name of the “less experienced editor” (Sita Devi Dasi), and he claims that her editing made the new version read “more smoothly” and made it “closer to the original transcription”. 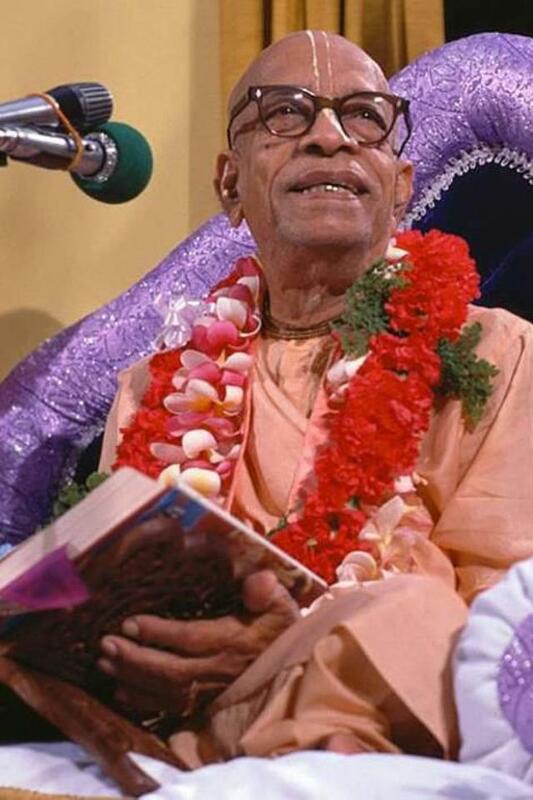 But he later had to admit that this new and less experienced editor was allowed to change the books of Srila Prabhupada without proper supervision, and that her editing was not good enough. No good deed goes uncriticized. 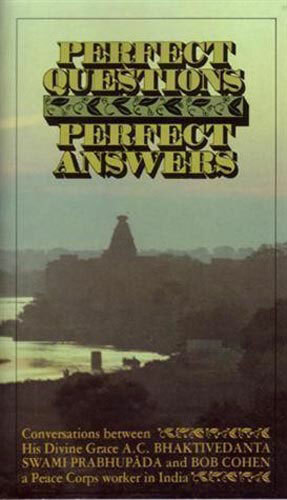 Recently someone has tried to stir up a new criticism of the BBT by pointing to the re-print (in the 1990’s) of the book Perfect Questions Perfect Answers. Some 20 pages were taken out of the book. Why? At that time PQPA had been out of print for a long time. The devotee in charge of operations really wanted to re-print the book because he liked it so much. However there was a problem. The book was around 120 pages long. The small books that the BBT were printing at the time had been formatted into 96-page books so that the printers would give a really good price. If PQPA were printed at the 120 plus pages then most of the distributors would not buy them and distribute them because such books as Perfection of Yoga, Beyond Birth and Death, etc were cheaper. Our devotee in charge of operations read the book and a good section consisted of a conversation between Srila Prabhupada and an Indian gentleman who was also present at the time. So our devotee figured that this part could go because it was not really part of the conversation between Bob Cohen (now Brahmatirtha Das) and Srila Prabhupada. But this was just not enough to bring it down to the 96-page format so a few more pages were cut. 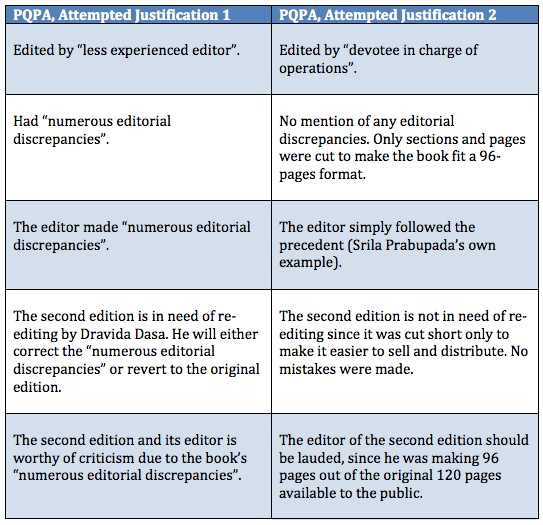 In addition to this, Madhudvisa Prabhu has documented that in fact the second edition has not just had sections and pages cut out. Quite a few individual words and sentences have been randomly removed. Here is a link to Madhudvisa Prabhu’s comparisons. Please check it out yourself. Our questions to BBT International: What is correct here? The first or second explanation? Or a combination? Or a third or fourth explanation? The controversy about the editing in Srila Prabhupada’s books are now to be found on Wikipedia. Did Jayadvaita Swami and the BBTI really think they could eternally hide the fact that they are editing the books? People will now realize that they cannot trust the books they buy from the International Society from Krishna Consciousness. They might buy one of the other 700 translations of the Gita. Srila Prabhupada’s movement has been greatly harmed. Answer: By never changing the books in the first place! 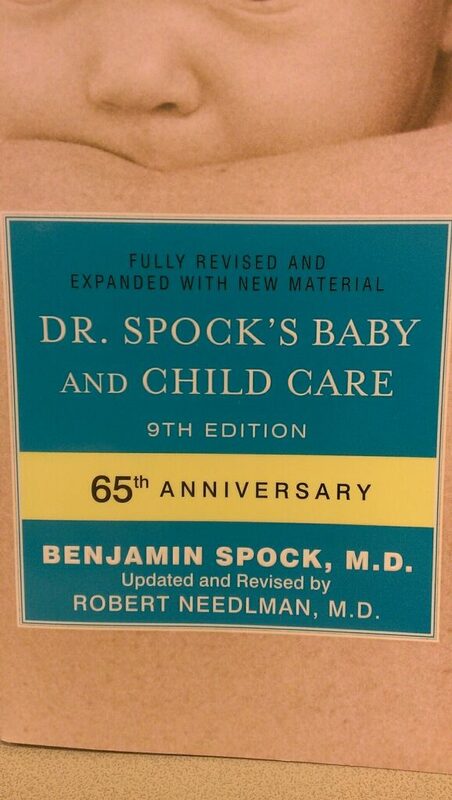 Hopefully people will soon start to ask for the original edition.